Moisture fresh figs is more than 70%, it is not easy to preserve. which can help to digest food and promote appetite, and because it contains a variety of lipids, it has the effect of embellish aperient bowel function. However, water content of fresh figs is more than 70%, it is not easy to preserve, and mostly replaced by dried or made into preserved fruit for sale. 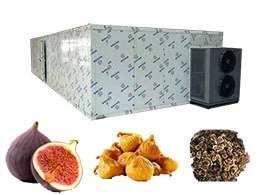 Moreover, the hygiene of drying process cannot meet the requirements of food production. Heat pump dryer absorb the heat from the moisture in exhaust hot air, and then release these heat in condenser to heat the drying air again. Only compressor power is request that means power consumption is few. Select ripe figs, remove rotten figs and other impurities, and rinse with water, cut off the fig stems. Cut fig into four to six pieces to increase the contact surface between fig slice and hot air , shorten the drying time. Pay attention that ventilation and dehumidification while temperature rising, so as to facilitate moisture evaporation. 1st, Raise the temperature to 75℃quickly(in one hour) and keep temperature @ 75～80℃, humidity less than 50% for 4 hours, to accomplish most amounts of water evaporate in a short time. 3rd, keep temperature @ 60～65℃, humidity less than 10% for 4-6 hours. Final dried fig slices will have 14-15 moisture. Cover the dried figs with plastic film and let them soften for 2-3 days. The whole figs without slicing will take longer to dry.